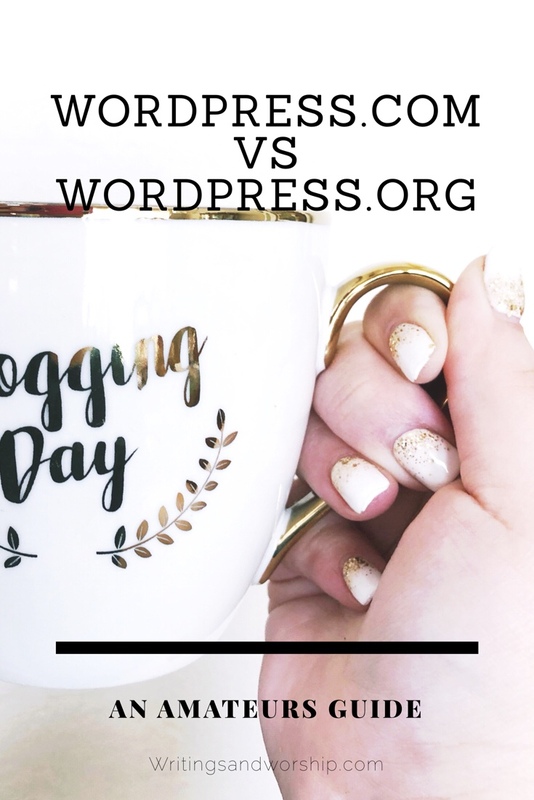 The infamous debate….wordpress.com vs. wordpress.org. If you are a blogger, influencer, creator, etc. you have probably had to make this decision at some point in your career (or will make it at some point). I recently made the switch from wordpress.com to self-hosted through Siteground on wordpress.org. Honestly, I knew nothing when I made the change. I was completely lost but I knew it was a switch I needed to make. I was previously using the free plan on wordpress.com and I only paid for my domain. However, I could really tell that it was holding me back. But I knew nothing about self-hosting, backdoor coding, or how to switch a blog over. I was incredibly nervous as I started making the change. Now I am a few months into my new self-hosted site on wordpress.org and I am LOVING it. I knew I wanted to make a post about it because I know there are other bloggers out there as clueless and nervous as I was but want to make that change. There are plenty of in-depth and technical posts out there about the differences and how to switch but I am giving you an amateurs guide to it! A quick and easy look at what my favorite changes and aspects have been and why I think it would be worth it for you. I am an amateur when it comes to the downloading and all the technical aspects. I thought it might be nice for other bloggers to see some info and reasons behind why I changed and what I love about it from a non-technical point of view. I was searching for a post like this when I switched, so I hope this helps one of my fellow bloggers out. To make it easier, I will be sharing 5 facts/reasons/tips for why I am so glad I switched to self-hosted. I started this blog for a class assignment my senior year (2015). After I graduated I realized I fell in love with blogging so I continued. I was using Wordress.com, their free plan, and after a while, I purchased my domain name. When I was blogging, the huge majority of my traffic was from Facebook and Facebook alone. I was getting fed up without being able to do ads, install plug-ins, and my traffic was coming from really only one source. I switched to self-hosted WordPress.org with SiteGround in the fall of 2017, and I could not be happier. Now that I have switched my traffic comes from Facebook, search engines, and Pinterest almost equally at the moment. Before I switched I rarely got any traffic from search engines…so that was a big step. I also priced it all and it was cheaper to do self-hosted than to upgrade to a premium account on wordpress.com. I was most nervous about the actual switching process, I was completely clueless as to how to do a big change like that. Let me settle your fears, SiteGround did it all for me. (insert praise hands) I literally did nothing but verify some emails and wait for them to complete it. Even if you need help doing the few things you have to do, they walk you through it all! I honestly asked those poor support people a million questions and they were patient, helpful, and walked me through anything I didn’t understand. If you aren’t confident in switching over your blog, let the hosting platform do it for you! I purchased a theme from Etsy after much consideration and I have fallen in love with it. It’s feminine, easy to manage, and allows for some customization. I highly recommend investing in a blog theme you really love, that is another thing I couldn’t do with WordPress.com, no custom themes! If you’re wanting to monetize your blog, a great way to do it is by placing ads for a price on your blog. When I was with WordPress.com I couldn’t place ads, my plan never allowed it. Even if you don’t make a ton of money, ads are still a stepping stone to getting monetized. WordPress.org not only allows ads but they make it extremely easy to place them! Even I, a non-techy, was able to place them within minutes. Plug-ins are a perfect way to jazz up your site, increase awareness, and help pump up your blog. From SEO plug-ins to contact pages, there is a plug-in for everything under the sun. I have been able to do pop up subscriptions, click to tweets, and even better social media buttons. There are multiple options for any need you might have for your blog. Plugins have really stepped up my game and I am learning how helpful they are! I am planning to do a post about my favorite plugins soon. I tried many different free themes on here when I switched, but I could never find a good one. With WordPress.org you have the ability to load a custom theme which is amazing! So if you are a website designer, this one is for you. And if you’re not, and need to just buy one, Etsy is a great place to find them! I think having the ability to decide your own theme is so important. I became so proud of my blog once I bought a theme I really loved. There’s so many different kinds: feminine, modern, colorful, etc. I found most of them are between $10-100 so there should be a theme for any price point! This point really goes with all of them. The overall control is why I’m glad I changed. From themes to plugins, wordpress.org is made for YOU to be behind the wheel of your own blog. WordPress.com is great for new bloggers or someone that just blogs a little on the side. It was perfect for me until I decided I was serious about blogging. I’m so glad I have more options and more control over all the little parts of my blog. But remember you’re not alone! Your hosting platform and wordpress.org both have incredible support teams! Overall, do some research, crunch some numbers and make the best decision for you. If you’re wanting more control and to monetize, then I totally recommend to switch over. I just made the switch last weekend! I was about to ask what plugins you recommend so id love to see a post on that. I had word adds through WordPress but I need a new ad plugin now! I’ll have to try that one!!! Thanks for stopping by! This is an awesome guide for the differences between the two WordPress options! My husband has bumped into this issue and has been avoiding making a decision, so I’m definitely going to send this to him! There are so many choices out there about what services to use for your website. This is such a helpful guide for people interested in wordpress. Being in control of your content and how it is laid out is key! This is such a great article for me since I just got back into blogging again. I have heard really good things about WordPress even though my blog resides on Blogger. I wonder if I should switch my platform, I guess will have to do some research. Thanks for sharing!! I WISH you’d written this article a few years ago when I was building my site! Such great advice! I think your fourth point about control is everything! This is such a good resource for anyone feeling nervous to take the plunge to WordPress.org! THANK YOU! I could never really grasp the difference. Very glad you broke it down for me :). Love your blog! Oh man this is great— I’ll have to direct my wordpress blogger friends to this article and make sure they know the benefits of switching! How insightful and thank you for sharing your behind the scenes discoveries! Thank you!Very interesting article to understand the differences between the two WordPress! I’m totally new in the blogging world! I hope you found it helpful! Thanks for reading. I didn’t even know there was a difference! This was such an informative read. Thanks so much for all the insight. I have alot to think about.